Be an endlessly classic and bohemian beauty, wearing the GizzA - Vicky Tank Blouse and Trousers. 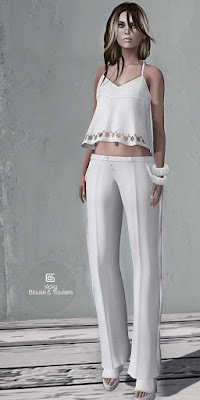 Light and breezy trousers are paired with a cropped tank top styled blouse which has floral cut outs at the hem. A selection of 6 colors for the blouse as well as the trousers are available for you in the main store, all sold separate, for your mix and match styling possibilities.